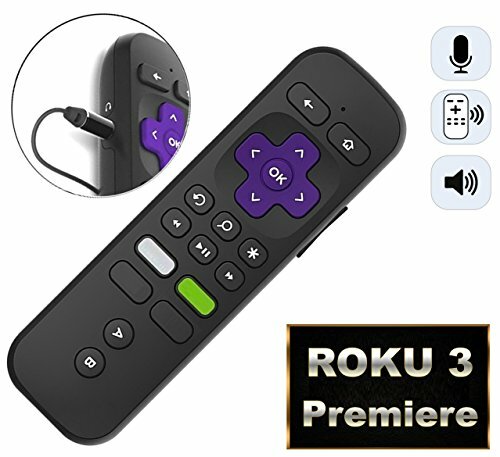 New Roku Enhanced RF replacement remote w/ Headphone Jack, Pairing Button, Voice Control, Lost Remote Finder and Game Function, 4 Shortcuts for Roku Ultra, Roku Premiere/Premiere+, Roku 4/3, Stick/Stick+ streaming players. This remote use RF Technology - which gives you control of your Roku player behind closed cabinets and walls. The loss remote finder feature enables you to find the remote much easier so you will never loss the remote again! The Private Listening mode is only available on Roku players that originally supports the feature. The headphone is not included. NO TV Power Button on this remote. Use 2x AA batteries, NOT included. NO TV Power Button on this remote. Does not have IR(Infrared) function, NOT support Roku Express or Roku Boxes that only use IR sensor. eg, Roku 1,Roku 2, Roku LT, Roku HD, Roku XD/XDS.